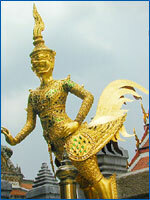 The temple is in the outer section of the Royal Enclosure west of the Grand Palace . It was built on the orders of King Rama I along with the Grand Palace and Rattanakosin Island , and is built as a temple in a Royal compound like Wat Sri Sanphet in Ayutthaya . It has no resident monks. The Emerald Buddha (Phra Putta Maha Mani Ratana Patimakorn or Phra Kaeo Morakot): This is a Buddha image in the meditating position in the style of the Lanna school of the north, dating from the 15th century AD. King Rama I brought it from Vientiane , and it is considered to be the most important Buddha image in the country. Model of Angkor Wat: King Rama IV had this built by Phra Samphopphai when Cambodia was under Siamese control. The model was recreated in plaster at the behest of King Rama V to celebrate the first centenary of the Royal city. Prasat Phra Thepidon: This four-square prang originally called "Puttaprang Prasat" was built in the reign of King Rama IV. Inside are statues of Kings Rama I-King Rama VIII, to which the public pay their respects on Chakri Day, April 6, every year. Mondop:This structure stands behind Prasat Phra Thepidon, and was built in the reign of King Rama I. Inside is a cabinet holding the Buddhist scriptures beautifully decorated in mother-of-pearl. Balcony: This can be compared to the temple wall. The murals inside tell the Ramayana story in its entirety. On the columns of the balcony are stone inscriptions of the verses describing the murals. Phra Sri Ratana Chedi: Built in the style of Wat Sri Sanphet in Ayutthaya , this chedi is to the west of the Monhop. Inside is a small chedi with relics of the Lord Buddha. Phra Atsada Maha Chedi: This group of eight chedis stands in front of the temple. It was built in the reign of King Rama I and dedicated to the heavens. Six of the group are outside the balcony, two are inside. Each has its own name. 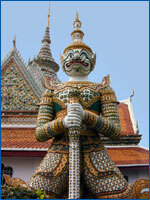 Yaksa Tavarnbal (Gate-keeping Giants): Six pairs of mythical ogres stand at each gate of the Balcony. These are the main Giants of the Ramayana. Hor Phra Khanthan-rat: Standing in the estern corner of the balcony, this is where the Phra Puttakhanthan-rat figure is enshrined. 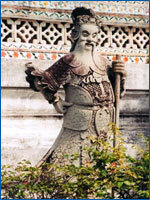 It presides over the Royal rain-making ceremony and the ceremony of the first rice planting. Inside are paintings by the mural artist Khrua In Khong. Hor Phra Ratcha Karamanusorn: Inside this structure are 34 Buddha images in various positions, built by command of King Rama III and dedicated the kings of Ayutthaya and Thonburi. Hor Phra Ratcha Pongsanusorn: Built in the reign of King Rama IV, this is the location of the Buddha image of the reigning King of the Rattanakosin Era. Inside are murals of Royal chronicles of Ayutthaya by Khrua In Khong. Hor Phra Nak: Situated behind the temple, this traditional Thai building roofed with glazed tiles contains the ashes of the Royal family.